Emulating the PS2 requires a decent computer. Expect to be playing with settings. As stated before you will need a decent computer but since not everyone has the same hardware the settings you may have to use may not be the same as someone else. The community is small, don’t expect to be playing at any hour in the day. Currently everything that the base game offered works. There may be some hiccups with frame drops but that’s the nature of the beast. Map packs can work however there are some caveots with using them. You can read about this here. Xlink Kai Click the download button at the top of their page. While you are here also create an xlink account if you do not already have one because it will be needed later on in the guide. Anything listed here is optional but will also have a section in the post that will go over how to install them as well as setting them up. The above files will always be the most current version. If you wish to follow his development and read up on the patch notes, you can do that here. DvD Decrypter You can get the download from their website. You would only need this if you wish to make an ISO image of your copy of socom 2 to use with the emulator. The following is only for people on windows 7 as anyone on windows 8 and newer should already have the xbox 360 controller drivers by default. If you are unsure if you have windows 7 32 bit or 64 bit you can follow this link and it will tell you how. Extract the pcsx2 folder from the pcsx2.zip file to a location of your choice. Extract the CLR_DEV9.dll file from the CLR_DEV9.zip to the Plugins folder in the pcsx2 folder. Extract TAP Driver.exe from the Tap Driver.zip file to the folder of your choosing. Run the TAP Driver.exe and follow through the steps. On the “Choose Components” step, select TAP Vritual Ethernet Adaptor and click next. This is a default option but if it for any reason is not checked make sure it is. Allow it to install to the default location. In my case it is “C:\Program Files\TAP-Windows” and click install. Once it finishes installing restart your PC. After your PC is rebooted go to your PCSX2 folder and launch it by double clicking on the pcsx2.exe file. You will be presented with the “PCSX2 First Time Configuration” wizard. One the first screen select your language or stick with the System Default and click next. You will then be presented with the Plugins window. Select the plugins to match the screenshot. We will be configuring the plugins in a few steps later so for now just click next and you will be brought to the Bios Selection screen. 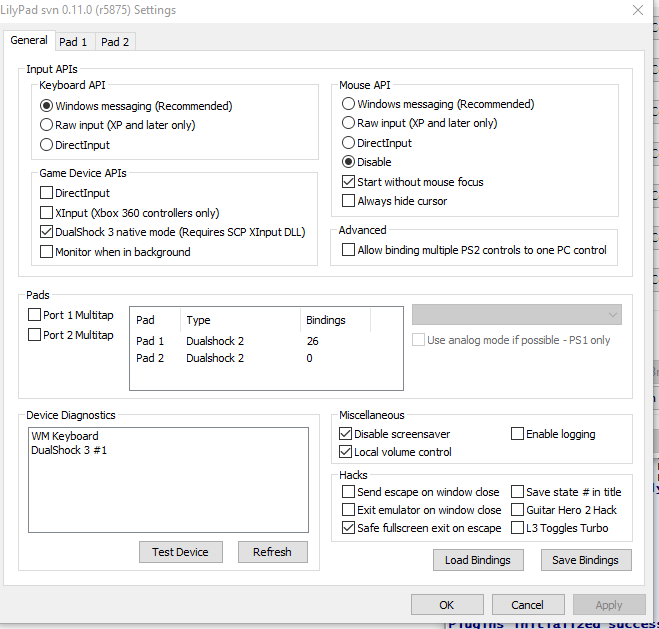 Click on Config on the top menu bar and then click on emulation settings. 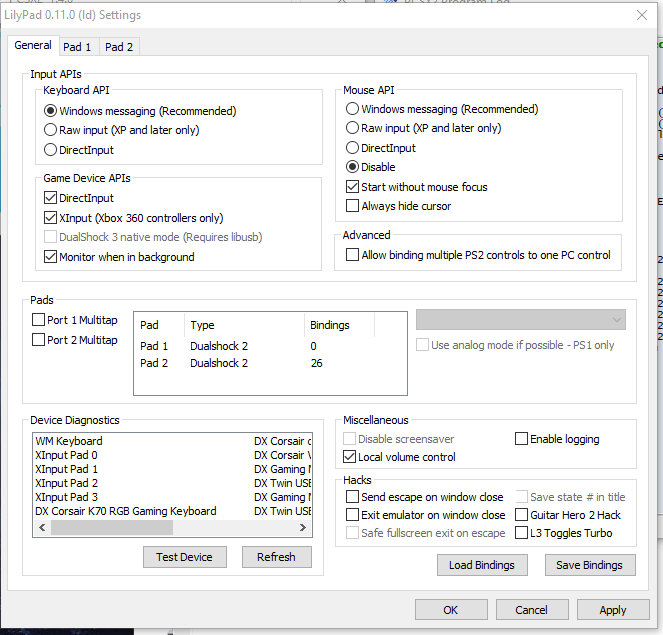 At the bottom of the window uncheck the checkbox that says Preset and then click on SpeedHacks in the left hand column. On the EE Cyclerate set it to -1 and on VU Cycle Stealing set it to 2. If you have a quad core processor make sure to check MTVU (Multi-Threaded MicroVU1). If you plan on using your socom 2 disk you can also check Enable fast CDVD. 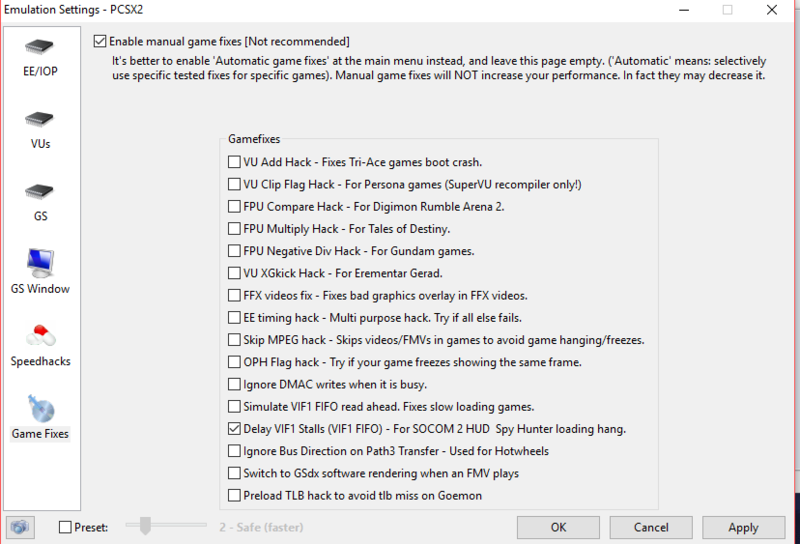 After making the changes to Speedhacks, head on down to Game fixes on the left hand column and check Enable manual game Fixes. Check Delay VIF1 Stalls. Click Apply and then OK and you will be brought back to the pcsx2 window. Click on Config on the top menu bar and then click on Memory Cards. If you do not see a memory card under Unused cards then click the browse button which will open a new window. 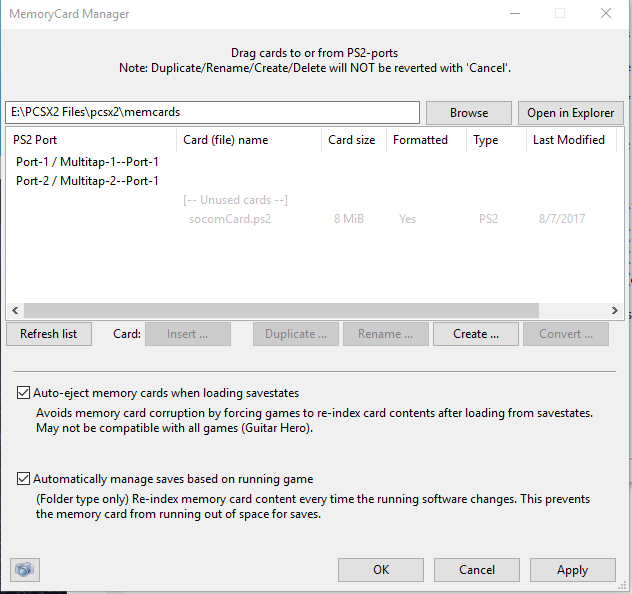 Navigate to the memory card folder in your pcsx2 folder and click the select folder button. You should see a memory card show up called socomCard.ps2 under Unused cards. Right click socomCard and click on Insert card. From there make sure that Port-1 is selected and click Ok. It will now show that socomCard.ps2 is in slot one. Click Apply and then Ok. You will be brought back to the pcsx2 main window. Click on Config on the top menu bar and select video (GS). A new menu will appear and from that menu select plugin settings. Under Adapter, either select your video card or leave it as Default Hardware Device. (This is mainly directed to people on laptops that may have more than 1 GPU for based on power states). 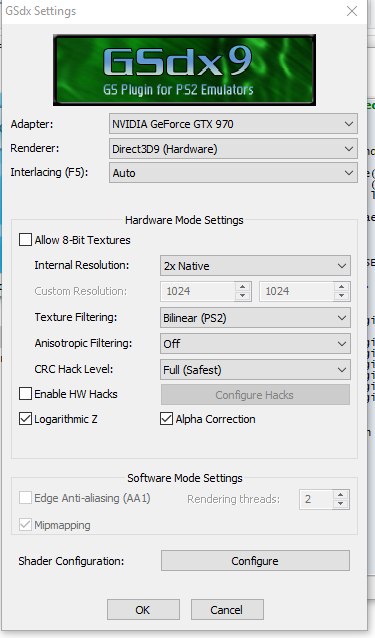 Set renderer to Direct3d9(Hardware). 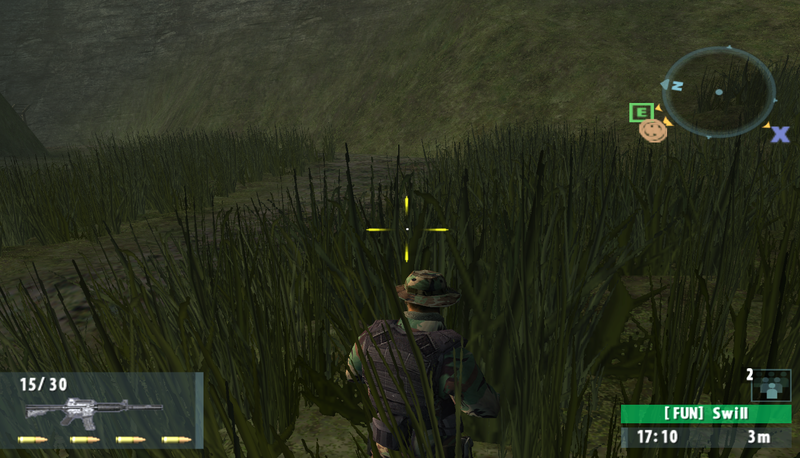 Direct3d11Hardware (and software) tend to have problems with some maps in Socom 2. While Direct3d11(Software) can make them playable, it’s not ideal. Direct3d9 seems to give you a little more performance for the time being. If you wish to up the internal resolution I suggest either 2x or 3x. If you have a powerful GPU you could go higher but it’s not really that noticeable. If you are wondering what this will look like, refer to the screenshots at the top of this post. Check Logarithmic Z and Alpha Correction. Once you do all this, click OK and you will be brought back to the main pcsx2 window. Click on Config on the top menu bar and click on Audio(SPU2) and click on Plugin Settings. Keeping everything as the default is fine. However if you experience audio problems later on, this is where you will go to tweak those settings. Click OK and you will be brought back to the pcsx2 main window. Click on Config on the top menu bar and click on USB and then plugin settings. This will open up the Qemu USB Configuration window. Under Device Type select Logitech USB Headset under port 1. It doesn’t matter what your actual headset is this is just how the plugin works. Set port 2 to None. Under Device API port 1 select WASAPI and then click the Configure button next to it. From here we can set up our headset audio in and out to whatever headset device you have. For Audio Input Player 1 select your headset speaks. Keep Player 2 set to none. For Audio Output set it to whatever device is your microphone. Keep the Input Buffering and Output buffering to their defaults. These can be tweak if you need to later on. Click Ok to close out of the Qemu USB Configuration window. You will be brought back to the pcsx2 main window. Notes: If you want to have pressure sensitivity (being able to crouch is the main reason to want this) then I suggest using a PlayStation 3 controller. There are additional steps for using this and a different plugin. I will be going over using a generic controller and the PlayStation 3 controller in this section. If your controller is not already plugged in to your computer do so now. Click on Config on the top menu bar and click Controllers (Pad) and then in the new menu list click plugin settings. The LilyPad Configuration window will open up. Click on the Pad 1 tab and you will be brought to the controller mapping window. Click on a button (Square for instance) and then press the button on the controller that you want square to be. You will know if it bound because there will b e a list on the left hand side saying what controller button does what. If your controller supports rumble you can go down to the Add Force Feedback Effect and select your controller. You can adjust the motors by clicking on Big and Small motor. Once you are finished click apply and then OK to be taken back to the pcsx2 main window. Close out of PCSX2 for now since we are going to be adding in a new plugin and another file to the pcsx2 folder in just a few steps and we will need to re-open pcsx2 anyways. If you haven’t downloaded the SCP DS Driver Package (PS3 Controllers) I suggest doing this now since it will be required. 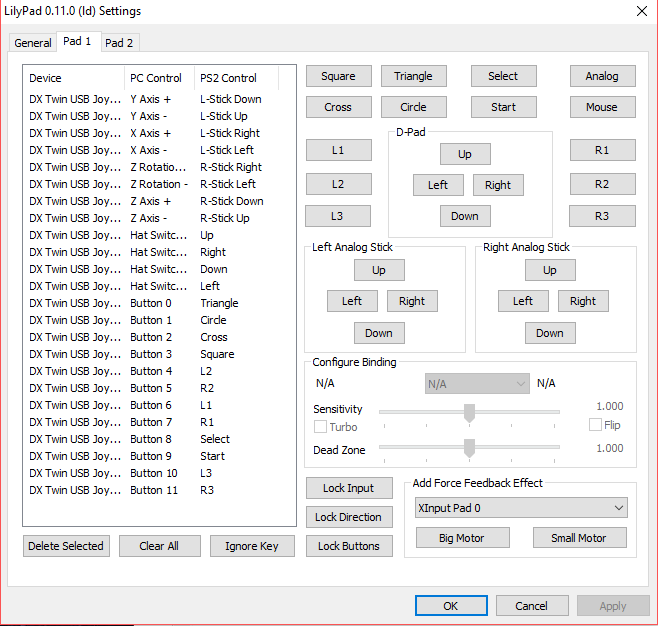 If you are on windows 7 you will also need the xbox 360 controller drivers that I linked above. Make sure to get the correct one that matches what version of windows 7 you are using bit wise. If you are on windows 7 then you will need to install the xbox 360 software first. Extract the SCP-DS-Driver-Package-1.2.0.160.zip to a location of your choosing. Where ever you put this it will need to remain there so put it somewhere where you won’t delete it. Inside the SCP-DS-Driver-Package-1.2.0.160 folder is another folder called ScpServer. Open that up and then open the bin folder. You can delete the source folder since it is not needed. However if you wanted to compile this yourself or make changes, the code is there to do so. There are newer versions of the software however I have had some issues with it and what I have posted is what has worked for myself and others. If you would like more information I suggest going to the pcsx2 thread and reading up on it there. Plug in your Playstation 3 controller and launch the ScpDriver.exe file. Check Configure Service and Bluetooth driver (if you plan on using this over bluetooth. Keep in mind if you do not have a blue tooth dongle this option won’t apply to you. Launch ScpMonitor.exe by double clicking on it. You will not see a window open however you should see an icon in your task tray. Double click that icon and you will be presented with a window that looks like the following: You should see a mac address of your controller and since it is plugged in may say that it is charging. You can close this window by clicking on the X. In the bin folder open the Win32 folder and move the LilyPad-Scp-r5875.dll file to the plugins folder in your pcsx2 foldder. In the Win32 folder take the XInput1_3.dll file and move it to the root of your pcsx2 folder. 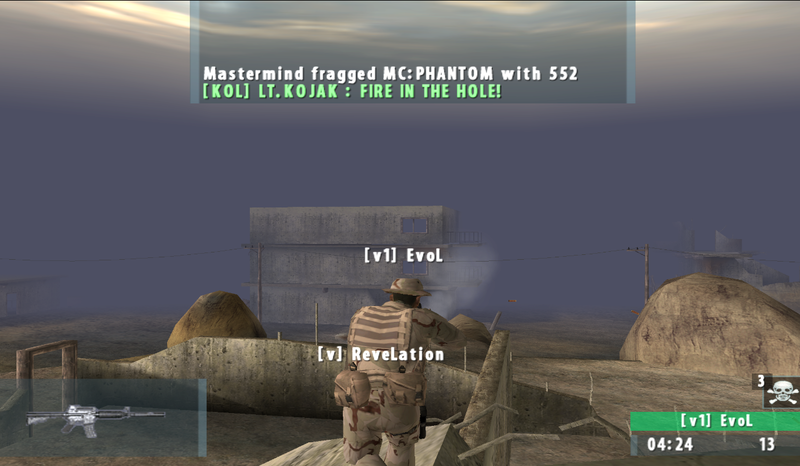 The root of the folder is the location where pcsx2 exists or refer to the screenshot. Re-open pcsx2 by double clicking on pcsx2.exe. Click on Config on the top menu bar and click Plugin/Bios Selector. Click on Plugins on the left hand column and for Pad select lilyPad svn(r5875) 0.11.0 [LilyPad-Scp-r5865]. From here we can click configure next to the Pad selection and the LilyPad svn Configuration window will appear. Click Ok and you will be brought back to the Components Selectors Window. Click Ok again to go back to the pcsx2 main window. Click on Config on the top menu bar and click Dev9 and then click Plugin Settings. You will be presented with the Configuration window for the CLRDev9 plugin. Check the Enable Ethernet Checkbox and then click Options. Click Apply and the window will Close. Click apply on the ConfigForm window to go back to the pcsx2 main window. We will be coming back here in a few steps to setup the IPAddress information but first we need to acquire our PS2 mac address. Click on CDVD on the top menu bar and select No Disk. Click on System on the top menu bar and click Boot CD/DVD Fast. pcsx2 will start and you will be brought to the PS2 main menu. Press the button that you bound for Triangle on your controller and you will be brought to the Version information screen. At the very bottom you will see your mac address. Note the last 4 characters (the characters will be either Numbers or letters, not the : that seperates them) and head on over to the xlink page to generate a ps2 IP address. On the xlink page make sure Playstation 2 is selected and enter in your 4 characters that you got from the mac address. Note the IP address they gave you and head back over to pcsx2. Close out of the window that is currently running (the image above) and you will be back to the pcsx2 main window. Click Options next to enable Ethernet. Click on the check box named Intercept DHCP. The options below so become editable. For ps2 IP address enter the IP address that the xlink website gave you. For Subnet Mask enter 255.255.0.0. Leave both DNS1 and 2 set to auto. Click Apply and then Apply again to go back to the pcsx2 main window. You can close out of PCSX2 for the time being, we will be coming back to it shortly. 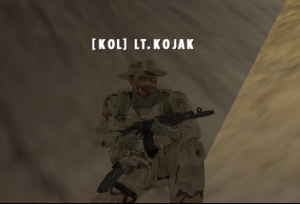 If you want to use your socom 2 disk then no further steps are needed other than a plugin change for pcsx2 which will be covered later on. If you want to create a backup of socom 2 to an ISO image and use that instead then I suggest downloading DVD Decrypter which I provided to where you can get that software. Open DVD Decrypter. If you installed it and selected the option to create a short cut on your desktop then use that to open it. 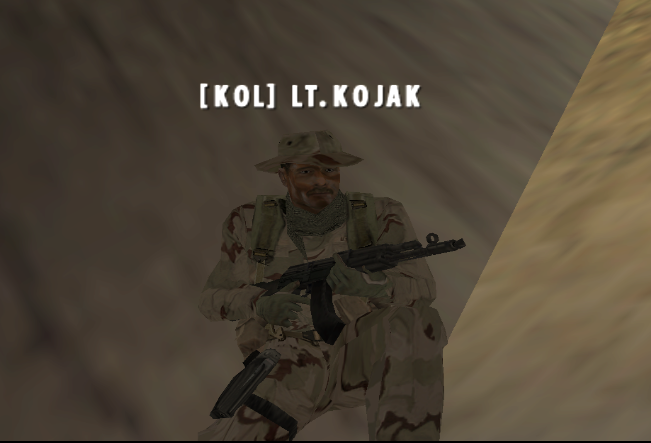 Insert your Socom 2 disk into your DVD drive in your PC and give if a second or two to load the disk. 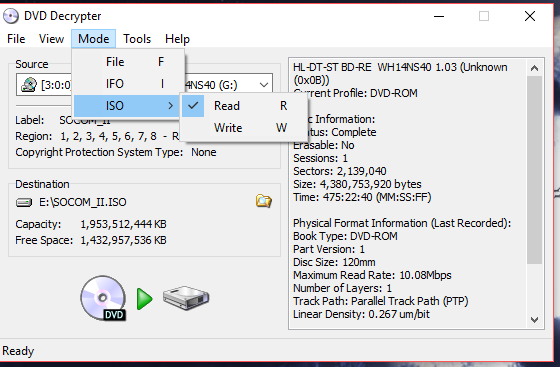 Where it says destination on the main program, click on the Folder Icon with the Magnifying glass and select where you want the ISO to be saved. Once you do that Click the DVD > Drive button at the bottom. This can take some time for the ISO to be written. If you have not already downloaded and create an account do so now. Open Xlink Kai and by default your web browser will open to a configuration page. Under Network Settings change the Network Adaptor to TAP-Windows Adapter V9. Under Engine Settings enter you xlink Kai Username and password and choose if you want it to auto log you in or not when the program starts. Click save to save your settings and you can close your web browser. Start Xlink and the program should launch. At the top of the program you will see that it says Messenger Mode and has some icons off to the right. Click on the Globe Icon. A list will generate on the left hand side that will show various consoles. Click the green arrow on the PlayStation 2. A new list will populate for all the games that xlink supports. 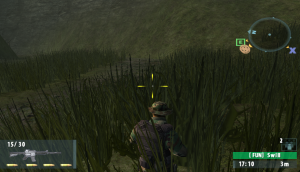 Scroll down till you see Socom 2 and click on the green arrow. Once again another list will populate with NTSC and PAL. Click the green arrow for NTSC. Xlink for the most part is all set up. You can leave this window open or you can minimize it. 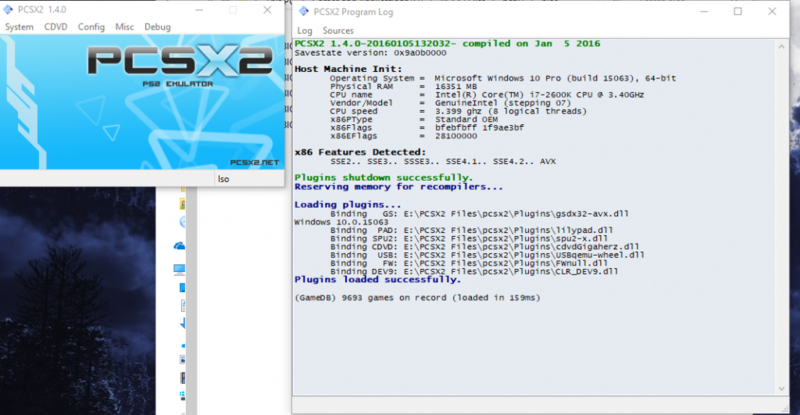 Launch pcsx2 by double clicking on the pcsx2.exe file. You will then be brought to the main window. Click on CDVD on the top menu bar and select Plugin Menu and then click Plugin Settings. From the drop down select whatever drive is the disk drive you are currently using. Click on CDVD on the top menu bar and select ISO. Click on CDVD on the top menu bar and click ISO Selector and then click browse. Select your Socom 2 ISO. Now you have a slight decision to make, you can either play the game vanilla in that you aren’t using harry’s patch or you can load harry’s patch. If you choose to use his patch then do the following. Click System on the top menu bar and click Run ELF. A file selection window will come up, select harry’s patch and it will load and automatically start the game. Nothing else is needed after this. You will need to do this every time you want to play. There are methods to get “embedded” into the game however this guide will not be covering that. You can read harry’s patch thread about things of that nature. The link is above. Go back to the Configuring network plugin section and drop down to step 12. Set PS2 IP, subnet and gateway to Auto by checking the checkbox next to those fields and hit Apply. If you have any questions or comments please leave then in the TRS thread. I had problems going through this. I did as listed (to the best of my limited knowledge, and still had issues. I extracted my own bios, configed as followed bit still had issues……I could really use some help…I think a few minutes on a messanger or on discord and I would be up and running….can you help? Apparently your message was put into moderation and I did not see this when it was posted. Were you able to get this working or were you still having problems? On step 7 I’m unable to pull up any bios plugins after clicking on the browse button. No plugins appear in the bios folder, but if I open up the folder in file explorer I am able to see all the bios files, just not through the browse method. Hi, so your method requires you to run Xlink on the same PC as PCSX2. I’ve got Xlink setup on a dedicated server PC for my Xbox. I’m interested in getting into the PS2 with higher res graphics than the actual console (I do own one, but I’d rather have the HD experience provided by the emulator). Can you think of any method that would allow me to continue hosting Xlink on a separate PC? So basically I’d like to have Xlink running on the server PC, and PCSX2 running on my gaming rig. I’d rather not have a virtual ethernet connection on my main PC. I do a lot of streaming and other network-dependent things, and the virtual interface could potentially create some complications. Any ideas? That’s nothing something I have tested however as for having the TAP adapter installed. I do similar things and I haven’t had it cause problems. I know in the past other adapters could be an issue with other LAN tunneling programs but this was in the windows XP days. If you manage to get that worked, please follow up on that because I’m sure other people might be in the same boat as you. Did you make sure to reboot after installing the TAP drivers? You may have to add PCSX2 as an exception to the windows firewall. It does not ask you automatically. I’m on the configure network step. It’s not showing my mac address at the bottom of the Version screen. Any help? I have Tap installed and have restarted my pc. I’ve never played on wireless however that shouldn’t be a problem. Did you take a look at the trouble shooting section? No, if you are using the memory card file that is provided in the download and you follow the network plugin setup instructions, that is all that is required. I get this all set up and connected, but it does not show any rooms for me. When I look for rooms, it appears that xlink is seeing my pcx (the Mac address is listed in devices). I have set it to port 30000. Any help would be appreciated. Ports shouldn’t matter since xlink uses upnp. When were you trying to play? If it was during the day chances are there just weren’t any rooms up. It was last night, there were 30 online in the room on xlink. That’s where I was told about the ports. Did you go through the trouble shooting part of the guide? If so the only other thing I can think of is windows firewall. You may have to make an exception for pcsx2. pcsx2 wont execute because MSVCP1450.dll not found? I am aware of it however till there is an actual official release I am shying away from dealing with constant updating of the guide (if things were to change). I know in 1.5 most of this guide isn’t really needed because the game generally runs fine. I however haven’t toyed with the updated plugin. Unless it has working HDD support, I will probably pass on it. Where exactly is this Pcsx2.zip file? Not sure what you are asking? The zip file is on the server. Once you download the latest version of PCSX2, just go into your ethernet settings on the plugin and choose tap, but don’t choose to intercept. Keep it all on auto. You should be good. You don’t actually have to set one for this either. If you head down to the trouble shooting section, it goes over that.